Shane Murray, Matt Dunn and Dan Leary have led the hockey team to a good start this year as they captured the Cashman Tournament in December and got wins against Abington, Sacred Heart and Silver Lake. It’s 4:55 am and the groggy athletes are already at the ice rink. The frigid temperatures and early morning starts are something that they are used to. 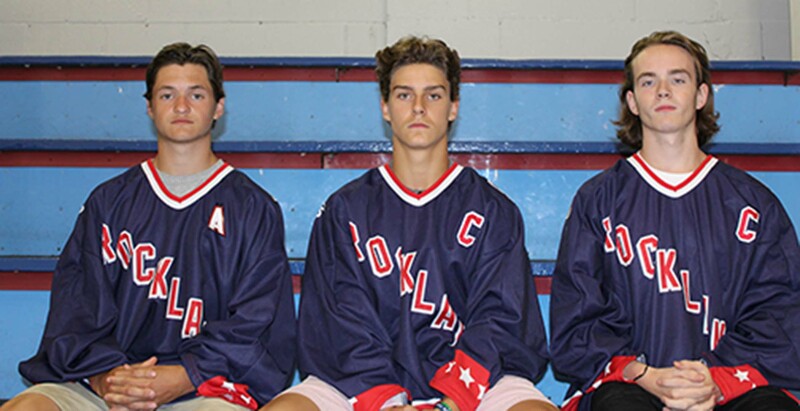 With success in their minds, the Rockland Hockey team is working hard and the athletes are preparing to have a winning season. But what gives them the drive to wake up so early and work hard? Freshman Jake Johnson plays goalie and has a true passion for the game. “I love hockey for its speed. It is one of the fastest sports with constant play time,” he said. Although confident with what he can provide for the team, Johnson is a little anxious to be playing with older and more experienced athletes. Johnson said, “I am a little nervous for this season because it is going to be my first time playing with the high school athletes.” Along with the younger players, the team is bringing back some experienced and talented players. Matt Dunn, a junior at RHS, varsity football quarterback, and hockey team captain, has truly found a calling as right offensive winger on the ice. Dunn explained how he has known his teammates for many years and has built chemistry and a great bond with them. “Well, growing up almost all of us played together in youth, whether it be with the Bay State Breakers, South Shore Eagles, or Boston Jr. Terriers, so playing together all throughout our lives creates great chemistry that leads to success on the ice and bonding off the ice. It’s awesome getting to play with these group of guys everyday. I wouldn’t want it any other way,” said Dunn. Over time, it is easy to build a love for a sport. You feel an attachment to it and you strive to get better and better. “The rush you get playing the game is just great overall. I love playing other sports, but there is something about hockey that catches me,” said Dunn. Dunn has not only become a reliable player on the rink, but someone who is willing to help out the team in any way possible, a true captain. “Personally I want to have an overall great year. I’m playing with the some great players that make me better everyday I step on the ice. Personal goals are good to have but I think the main goal is for me to do whatever I can to help our team win, no matter what that is,” said Dunn.